Then, having gone to the top of the world, he wanted to look further. He kind of wanted an observatory. He'd been setting up his telescope in the yard, but he yearned for more. "It's a hobby," he says. "It did get out of control. It's a very expensive hobby. It should be the cheapest hobby—it should be absolutely free. Anybody can go outside and they can simply look up. But then they say 'What is that?' And they buy a book to tell them what that is. And then they buy binoculars. And then they buy a tripod. It keeps going and going, like any hobby. And this led to the observatory." They had originally thought of building a two-story shed in the back yard with a roll-off roof, with the telescope upstairs and an area to hang out downstairs. But going outside seemed like a hassle during a harsh winter. Then Bob saw an advertisement for a dome. They decided they wanted to connect the observatory to the house, but they couldn't put the dome on top of the garage because it would eliminate both parking spots. They couldn't put it behind the garage either, because the house would obscure their vision. They had to build an addition. When they'd finally gotten their designs together, the town made them get approval from all of their neighbors in order to secure a permit, even though their plan abided by all the building codes and zoning laws. There was nothing illegal about what they wanted to do—it was just, well, different. They got the approvals, in exchange for a few promises that neighbors could come take a look. In the end, the town decided building a domed observatory extension to your house was okay because it kind of looked like a silo anyway, and other people in the area had silos. The observatory is a clever feat of engineering. 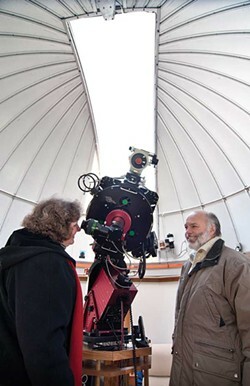 The concrete pier that the heavy telescope rests on—it weighs perhaps 200 pounds between the mount, the counter-weight and the telescope itself—has a platform atop it that can be raised or lowered electrically. The pier is 17 feet long in all, running downstairs, through the casing that Grimaldi's effigy hangs on, and then five feet into the ground below the foundation. It touches nothing but its subterranean base and the telescope. Everything else is built around it, to ensure that there is no vibration whatsoever. When you magnify your vision by up to 491 times, the slightest tremor at the other side of your house will seem like an earthquake when you're looking through the lens. You can set a glass of water on the pier and jump up and down on the floor around it, and the water won't show a ripple. The dome came in a 2,800-pound kit from Illinois. It took a week to assemble. The walls have built-in speakers, a seemingly endless supply of power outlets and extra-wide window sills—for the cats. The carpeting has padding underneath it to cushion any would-be falls of the pricey lenses. By toggling a switch, the color of the light changes from white to red, so as not to interfere with your vision through the telescope but still allowing you to see where you're walking. Finally, when their pet project was finished, the Antols named it. They liked the Stargate movie and television shows, a military sci-fi franchise, so they put that in the name. They took their latitude and longitude—41 and 73. And then they honored their cat Grimaldi, who had died young of a heart condition, just three weeks before construction began. Stargate 4173 at Grimaldi Tower. 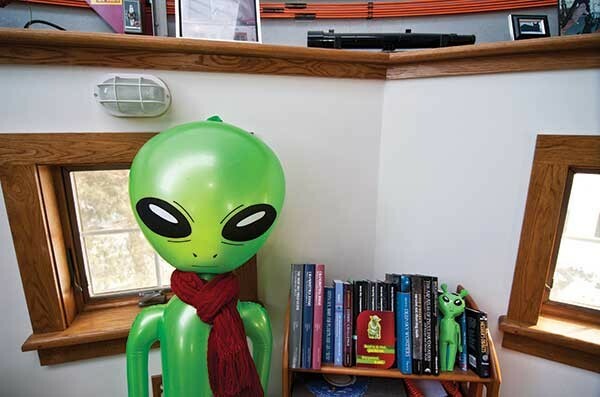 From this fanciful perch, Bob and Barb have seen things 300 million light years away. They've seen all the planets. They've seen the demoted planet Pluto. They've seen the polar icecaps on Mars. They've tracked the International Space Station. "It's amazing when you point at certain areas of the sky how much is out there, it's mind-boggling," Barb says. "There's just so many stars." Plainly, they're delighted with the unconventional decision to build an unusual addition. "Sometimes I come up here and still can't believe we did this," says Barb. They don't think it'll make it hard to sell their house. 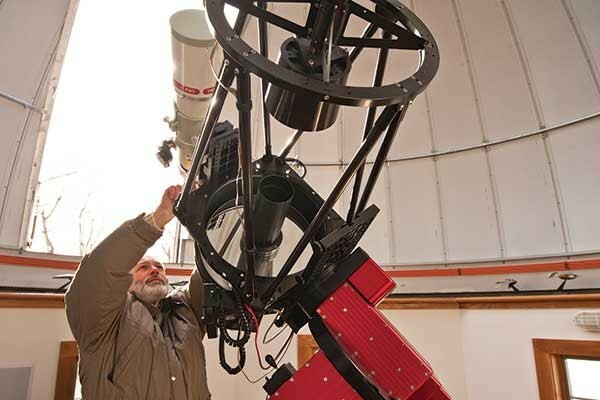 They figure there are enough fellow astronomy geeks out there to find a buyer. Failing that, somebody could probably turn it into an office or a gym. Bob sometimes hosts small science classes from local schools. But most of the time, they'll look up at the sky by themselves for anywhere from a few minutes to several hours. "Some nights we'll come up here and we have our lounge chairs and we'll bring a brandy, turn on the music and we'll open up this tiny slit," Bob says. "We're looking at the stars, sipping our drinks and just enjoying." The Antols document most everything. They tell me I'm the 248th visitor to their observatory. They keep track, because the 250th person to come through will get a commemorative gift, just as the 100th did. On my way out the door, I sign their guest book and they hand me a large postcard of the observatory. 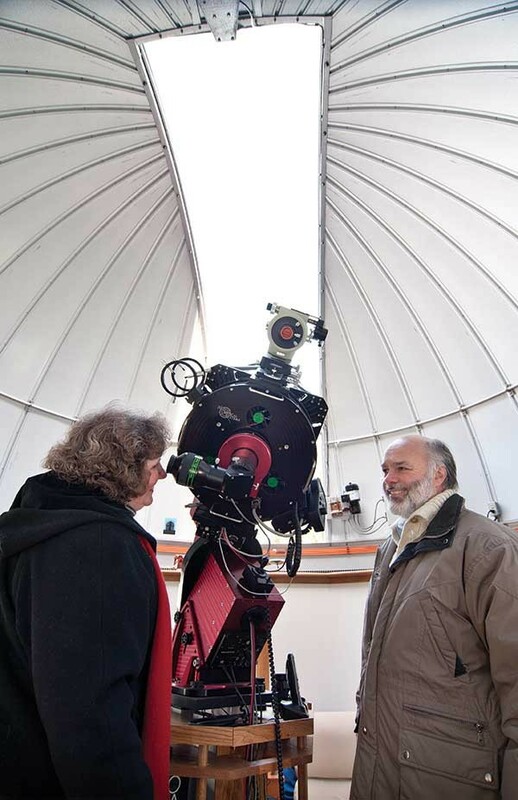 It's got some text in the corner: "We can see Uranus from here!"